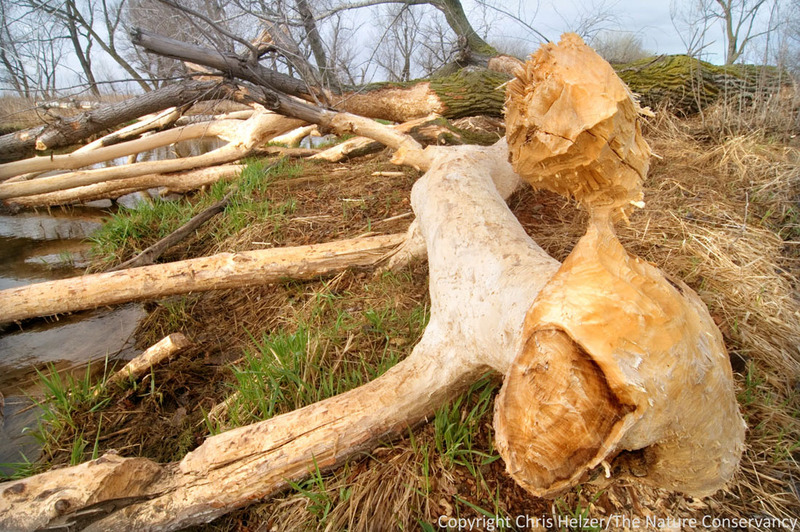 Beaver "sculpture" at the end of a downed cottonwood's branch. Click on the photo for a larger, sharper image. This week, I had some time to walk along the creek that runs through our Platte River Prairies. As I was walking, I found this big cottonwood tree that had fallen over and subsequently had most of the bark stripped off its branches. Clearly there were beavers at work. I was particularly drawn to the end of one large branch that had been chewed in an odd way. No, I don’t think it was done to be artistic, but I can’t actually come up with a logical scenario that explains it either. Accidental art? The two-foot diameter base of this cottonwood must have taken the beavers quite a while to work through. 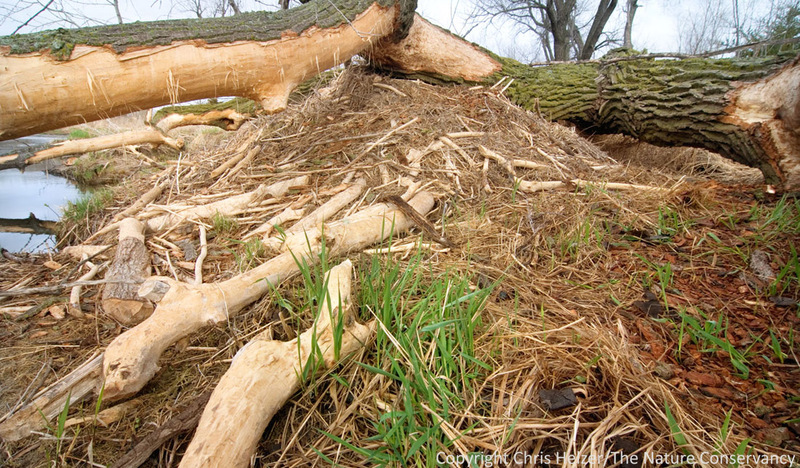 The cottonwood tree was very large – over two feet in diameter. A curious choice, since there were numerous smaller willow and cottonwood trees nearby. On the one hand, they gained an awful lot of branches and bark from dropping one tree. On the other hand, boy, what a job! I'd love to know whether the lodge was initiated before or after the big tree was dropped. It ended up being right underneath the fallen tree. Beavers are great engineers, of course, dramatically changing water courses and wetlands wherever they live. Sometimes that ability brings them into conflict with humans. We’ve been battling beavers at another of our sites where their dams are backing water over the roads that we and our neighbors rely on to get to our properties. In that case, the engineering of the beavers has been less pleasant to observe – though no less impressive. 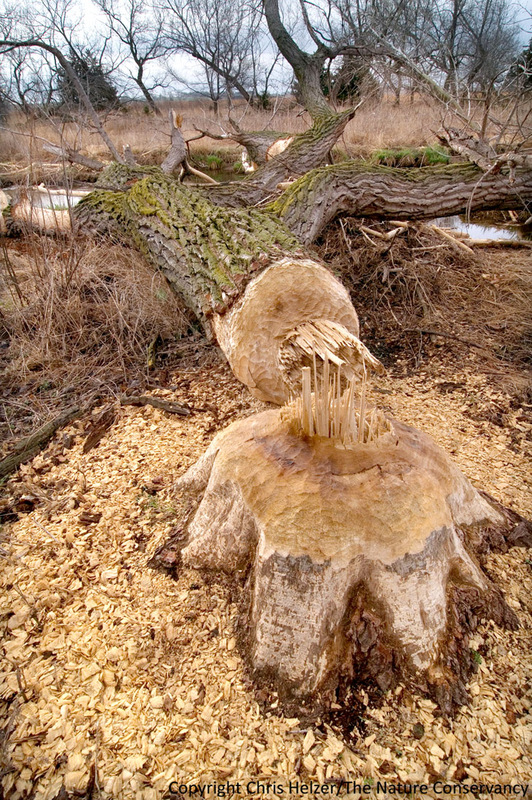 In the case of the “artistic” beavers in our Platte River Prairies, I’m happy to let them build and create at will. In fact, I look forward to watching what they come up with next. This entry was posted in General, Prairie Natural History, Prairie Photography and tagged art, beaver, cottonwood tree, lodge, nature, nebraska, outdoor photography, photography, sculpture, stream by Chris Helzer. Bookmark the permalink. I see big trees like this felled by beavers as well and wonder the same as you do. I don’t know the gnawing rate of the average beaver (sounds like a graduate student project to me…) but their return on invested time must be significant for this behavior to continue otherwise evolution would weed out beavers who spend too much time chomping on big trees! How many beavers gnaw on one tree this big at the same time? That sounds like a riddle! Many, many years ago I was walking through an area where beaver had taken down an impressive number of trees. In the midst of the downed trees and wood chips was an approx. 12″ x 6″ block of wood that had been carved in the shape of a duck. I am not kidding. It was a duck – head, neck, body – all there. It was clearly done by a beaver who had a real appreciation for its wetland companions. Carving decoys would be a good strategy if beavers ever did a dieary shift to anativory!